MORGANTOWN, W.Va. — Texas guard Courtney Ramey, a freshman, has been doing what freshmen do. They defer to the veterans and wait their turn. Here lately, things have been changing. Coach Shaka Smart has been pushing Ramey to be more assertive. “A lot,” Smart said. “Pushed him a lot.” Smart wants to see the “dog” that he recruited from St. Louis. Ramey, an intriguing four-star prospect, had a season-high 19 points against Georgia. It was the same total he put up Saturday night against West Virginia. “This was different,” Smart said. When Ramey took to the sky, caught a lob from Kerwin Roach II and hammered home a one-handed monster slam, the freshman served notice. Ramey is no longer just a freshman anymore. “I give it a 10 out of 10,” Roach said. Ramey’s thunderdunk and five 3-pointers sparked a burnt-orange avalanche as Texas captured a 75-53 win at WVU Coliseum. The last-place Mountaineers (10-14, 2-9 Big 12) are bad. Late in the game, two players got tangled up over a ball and watched it roll out of bounds, prompting boos from the home crowd. It was a far cry from two hours prior when WVU students were taking glow-in-the-dark foam fingers to create the Horns Down. Dana Holgorsen and Will Grier would’ve been so proud. Don’t take anything away from Texas, a team that erased the painful memory of a 35-point blowout loss in this same arena one year ago. It was Smart’s biggest loss in four seasons at UT. 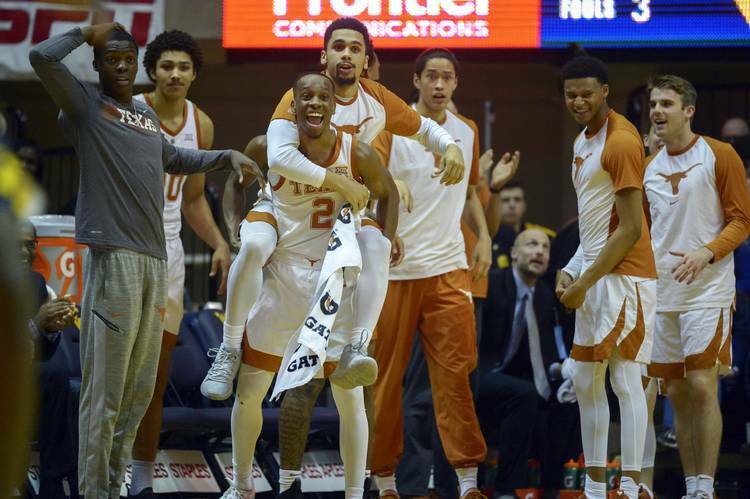 Now, the Longhorns (14-10, 6-5) have won three of their last four, and they’re playing like the team everyone back home expected all along. Texas returns to Austin and will have two home games this week. First on the docket is Big 12 leader Kansas State at 8 p.m. Tuesday. “I want them to really understand why we won and why we won convincingly,” said Smart, who captured his most lopsided Big 12 win in four seasons. “The hardest thing is putting it in a bottle and bringing it back out when the next game comes. But we have to keep getting better. That descriptive term accurately described the first half, too. Officials became the star, giving out fouls like candy. The two teams combined for 21 made baskets and 20 fouls in the first 20 minutes. Roach (14 points) opened the second half with a two-handed slam, and Ramey followed with a 3-pointer. The Longhorns were off and running. Dylan Osetkowski (10 rebounds) was grabbing everything he could as Jaxson Hayes (nine points) and Jericho Sims (eight points) took turns dunking down the stretch. Jase Febres drilled a 3-pointer with 13:47 remaining as Texas was on a 17-4 run. Huggins finally called timeout as WVU fell behind by 16. One Mountaineer fan walked by press row and was headed out the door. “I’ve seen enough,” he said. Ramey’s breakthrough didn’t happen this week or on the plane ride to Morgantown. It’s been building for the last month. Ramey said he’s been working with student manager Austin Chambers, getting up an extra 300 shots a day the practice gym for the last few weeks. Just him and Chambers. Day after day. “I just feel like my confidence has grown from that,” Ramey said. Ramey hit one 3-pointer practically from the banks of the nearby Monongahela River. He was 5-for-6 overall from 3-point range, helping the Longhorns shoot 39 percent overall from downtown. That dunk was spectacular, though. It gave Texas a 25-point lead with 10:47 left. It harkened back to the vicious slam Prince Ibeh threw down here his senior year or the one Jarrett Allen flushed in his one-and-done campaign. “If you noticed Courtney in warm-ups, we’re always throwing lobs and he misses ’em,” Roach said. Maybe it was a confidence issue. Doesn’t like dunking? Prefers layups? Still a freshmen, perhaps, but growing day by day nonetheless.